Four years ago, our organization opened in Michigan to serve as a non-partisan, research, information and advocacy center focused on what’s best for Michigan students. We’ve talked with dozens of organizations across the state and found there is a common set of myths about public education. For example, we often hear: “What else can we really do for our students?” The answer is: a whole lot. We have studied leading education states and examined what strategies have worked — and have not — in making them national leaders for teaching and learning. Take Massachusetts. Once a struggling post-industrial state like Michigan, today Massachusetts is so high-performing, if it were its own country it would be among the top six countries in the world. It’s reached its high performance by improving teaching and learning for all of its students — not just its wealthiest kids. Leading states dispel many myths about education in Michigan. 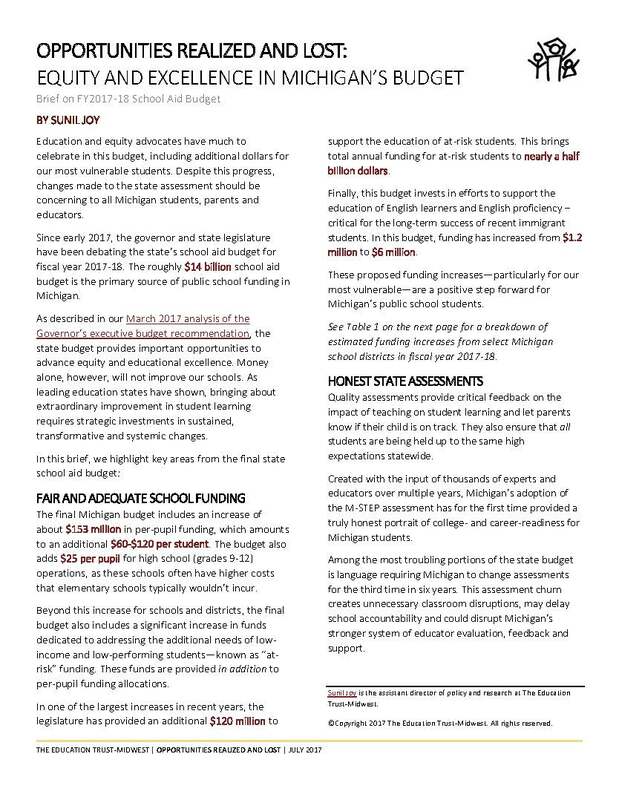 We must tackle these myths to make Michigan a top 10 education state. Michigan education is not what it once was. Today our white, African American and Latino students — and even our higher-income students — are trailing the country for student learning. It’s particularly dismal for our youngest students. Consider: Michigan is just one of six states in the nation that actually posted learning losses in fourth-grade reading since 2003, according to the national assessment. Some Michiganders wonder aloud if our kids are somehow innately inferior than kids in other states. Even our most enthusiastic elementary students have fallen terribly behind their American peers. Low-income students in other states are making huge gains in learning. As a state, we have done an exceptionally poor job of learning from successful states about how to lift up our low-performing students. Our kids are not the problem. Our systems are the problem. Over the last 15 years, research across the country has concluded the quality of teaching that a student receives is the most powerful in-school predictor of learning levels. Leading states have acted on this information. Tennessee, Florida, Massachusetts are among the top education states that have invested millions in professional development, performance systems and data-driven feedback to improve teaching quality. Their students’ skyrocketing achievement shows how hugely impactful these strategies can be, when done right. Money is the issue that Michiganders like to focus on, on both sides of the political aisle. This debate is often reduced to an “either/or” rhetoric that neither research nor leading states’ experiences supports. Money matters. However, state investment in education needs to be done strategically and wisely. Funding levels are particularly important for low-income children who are more likely to need greater supports to catch up with their wealthier peers. In Michigan, we often know what we need to do. Yet we don’t do it. Michigan education and business leaders, Democrats and Republicans all support a new state-wide educator evaluation and support system that would give Michigan teachers and principals the first data-rich feedback, coaching and consistent accountability to improve teaching in our state. Gov. Rick Snyder has committed more than $14 million to it this year, contingent on the bills being passed. This type of system has been extraordinarily effective at raising learning in Tennessee. This issue highlights one of Michigan’s persistent problems: We have lacked strong, consistent commitment to research-based strategies that are proven to raise learning. That means not just for a year or two, but in the long-run. Tennessee has been blessed with this leadership for more than a decade. The result: Recently it became the nation’s leading state for student improvement in key subjects such as fourth-grade reading. Leading education states prove this. With strong leadership, high learning and teaching standards, investment in school talent, systems improvements and sustained commitment and investment, Michigan can, too. Thankfully, more and more civic and business leaders and parents realize this. Now we need to make sure our state leaders understand they have our support for making the right decisions for our students. Amber Arellano is the executive director, Sarah Lenhoff is the policy and research director, and Sunil Joy is a policy and data analyst at Education Trust-Midwest.